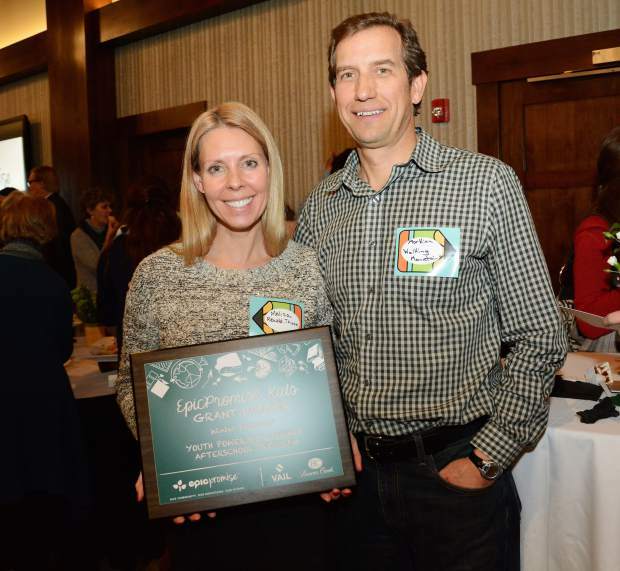 Melisa Rewald-Thuon, left, of YouthPower365 and Markian Feduschak of Walking Mountains Science Center mingle at Thursday's celebration of this year's grants to nonprofit groups from Vail Resorts' Epic Promise program. $7.6 million: Vail Resorts Epic Promise program grants in 2016 to nonprofit groups in resorts where it operates. $2.7 million: Epic Promise grants to Eagle County nonprofits. $1 million: Grants to environmental organizations through a guest donation program. $500,000: Annual grants from the Epic Promise Foundation, funded by employee payroll deductions. VAIL — The first big celebration at the newly-rebuilt golf course clubhouse honored the valley’s nonprofit groups on Thursday. The Vail Resorts Epic Promise program, which gives grants to community groups in all the markets where the company operates resorts, starts giving out checks in October or so. The company saves the Vail Valley for its final celebration. There are a lot of those celebrations, and a lot of checks get handed out. The Epic Promise program alone gave $7.6 million to nonprofit groups across the company’s resort communities this year, with $2.7 million in cash and in-kind services going to Vail Valley groups. In addition, the company’s “1% for the Forest” program has provided $1 million to environmental efforts on public lands. That program is funded by voluntary donations from lodging guests. The company has also established the Epic Promise Foundation, funded by voluntary donations from employees, including Vail Resorts CEO Rob Katz. The new meeting room at the golf course was filled with people from local nonprofits, as well as Vail Resorts and its various subsidiaries. Chris Jarnot, the former chief operating officer of Vail Mountain and now Vail Resorts Mountain Division Executive Vice President, was in attendance, as were the new chief operating officers of Vail and Beaver Creek, Doug Lovell and Beth Howard. “This is about what you do,” she said to the nonprofit representatives. With that in mind, Lovell said that Vail Resorts and nonprofit representatives got together in August to talk about youth programs, about creating more after-school and educational programs for local kids, and how to address some of the biggest problems youngsters face in the valley. With that in mind, Howard awarded a grant to YouthPower365, a division of the Vail Valley Foundation formerly known as the Youth Foundation. Specifically, the Epic Promise grant helps YouthPower365’s “Power Hours,” which provide after-school recreation and educational help to local students. The Vail Veterans Program was the recipient of the first Kenny Friedman award, named for a well-known figure in the local nonprofit community. Accepting the award, Cheryl Jensen of the Vail Veterans Program recalled a time she was talking with Friedman, who flipped the old cliche of “give ‘til it hurts” on its head. “He said, ‘No, you give until it feels good,’” Jensen said of her longtime friend. After the big awards were given and the mingling continued, Vail Valley Charitable Fund founder and chairman Rohn Robbins talked a bit about the importance of the Epic Promise program. “The mother’s milk of every nonprofit is money,” Robbins said. Having a community’s biggest employer involved in giving — and in a significant way — is important, he added. The example set by the Epic Promise program can be a way to spur giving from others, he said. • Bright Future Foundation for Eagle County. • Buddy Werner League of Vail/Beaver Creek. • CASA of the Continental Divide. • Children’s Garden of Learning. • Colorado Mountain College Foundation. • Eagle River Watershed Council. • Eagle River Youth Coalition. • Eagle Valley Child Care Association. • Eagle Valley Family Assistance Fund. • Eagle Valley Land Trust. • Education Foundation of Eagle County. • Friends of Colorado Avalanche Information Center. • Friends of Mountain Rescue. • Full Circle of Lake County. • Global Energy Forum Foundation. • Habitat for Humanity Vail Valley. • Ski & Snowboard Club Vail. • Swift Eagle Charitable Foundation. • Ute Springs Experiential Learning Center. • Vail Mountaineers Hockey Club. • Vail Performing Arts Academy. • Vail Valley Charitable Fund. • Vail Valley Medical Center. • Vail Valley Mountain Bike Association. • Vail Valley Salvation Army. • Vail Valley Soccer Club. • Vail Valley Special Olympics. • Walking Mountains Science Center. 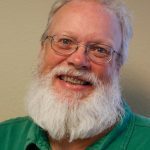 Vail Daily Business Editor Scott Miller can be reached at 970-748-2930, smiller@vaildaily.com and @scottnmiller.